This spring, New Economy Project attended Encore Capital’s annual shareholder meeting at the Hyatt Hotel in midtown Manhattan. Three members of our legal team, Eve Weissman, Susan Shin, and Nick Loh, went to the shareholder meeting to call out ways that Encore, among the country’s largest debt buying companies, harms New Yorkers. When we arrived, Encore tried to stop us from participating in the meeting, telling us we could not speak, even though New Economy Project is a full-fledged shareholder and even though Encore distributed a document at the meeting indicating that shareholders would each have three minutes to speak. Summons and Complaint we delivered to Encore. Click to enlarge. Our organization owns shares in Encore as part of our broader shareholder advocacy, and the company has repeatedly come up on our legal hotline, especially in the form of Midland Funding, which Encore owns. At the meeting, we played an audio recording by Esther Roman, a home health worker and Brooklyn resident who had called our hotline just a few weeks earlier. Ms. Roman’s words spoke volumes about the company’s practices. We wanted Encore’s CEO, board, and other shareholders to hear firsthand how Encore Capital’s business practices affect everyday New Yorkers. And we wanted the company to commit to provide redress to the thousands of New Yorkers the company systematically stripped of wealth through its fraudulent practices. My name is Eve Weissman. I’m a staff attorney at New Economy Project, an economic justice organization that holds Encore shares. We run a free legal hotline for low-income NYC residents. I am here today to share the story of one of our hotline callers, Esther Roman, a home health aide who found out just this past March that her wages were suddenly being garnished because of a judgment Midland Funding obtained against her 11 years ago. Midland obtained the judgment without ever notifying Ms. Roman that she was being sued and without providing the legally required proof. Not only did Midland illegally extract $100 from Ms. Roman’s wages before she was able to stop the garnishment and undo the judgment, but Ms. Roman was also forced to take three days off of work, costing her more than $230 in wages – a huge sum for someone who makes less than $400 per week. 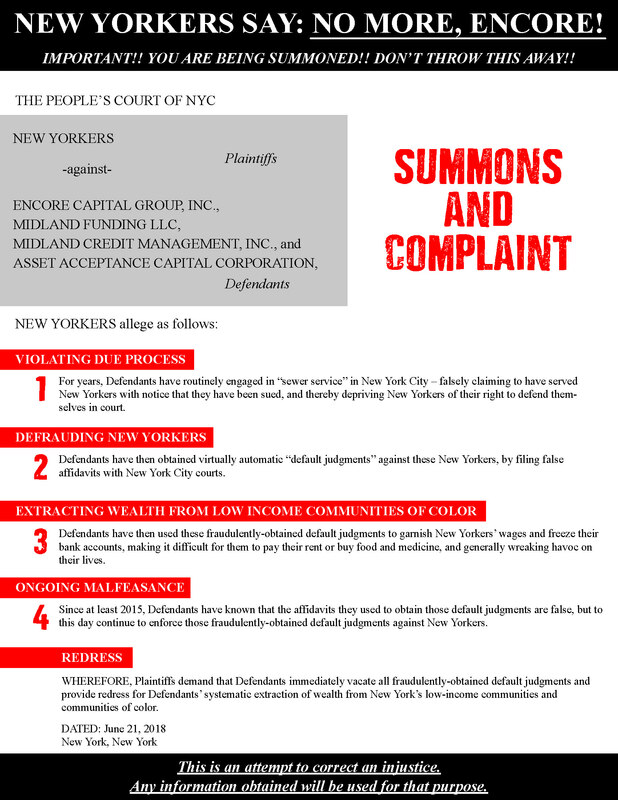 This story is just one example of how Encore Capital’s business model, including fraudulently obtaining judgments and then enforcing those judgments to garnish wages and freeze bank accounts, harms low-income New Yorkers. We want to know, will Encore commit to compensating Ms. Roman? And, will Encore provide redress to the other New Yorkers and communities harmed by its practices? Good morning. My name is Susan Shin. I’m the Legal Director of New Economy Project. For more than a decade, we’ve operated a free legal hotline for low-income NYC residents. We frequently hear from people, like Esther Roman, whose story you just heard, who were sued by Midland Funding. We’re here to ask: Will Encore commit to vacating judgments that it knows it obtained through fraud, and to providing redress to the NYC residents and communities it has harmed? In its Consumer Bill of Rights, Midland claims that all affidavits it prepares for litigation are accurate, and that its law firms are told to hire only process servers who follow the law. But that is not what is happening on the ground. We – and our fellow advocates – have heard from thousands of disabled, elderly, and working poor New Yorkers who learned that Midland had sued them only after Midland had already gotten a court judgment against them. How did they learn this? When they tried to use their ATM card, and discovered that Midland had frozen their bank account. Or when they got a marshal’s notice saying their wages would be garnished. They later discovered that Midland’s process servers had lied to the court about serving them – for example, by claiming to have served them at an invalid address or by making up a fake relative. And, in many cases, they learned that Midland’s process servers had been sanctioned by NYC regulators for not following the law. When we looked at these New Yorkers’ court files, we saw that Midland itself had lied to the court about the proof it had, claiming to have personal, firsthand knowledge about facts that only a bank or other type of original creditor could possibly have. Encore has been on notice of its false affidavits since at least 2015, when it entered into a Consent Order with the Consumer Financial Protection Bureau in which it agreed to stop filing false affidavits, and when new NYS court rules went into effect barring the kind of false affidavits Midland routinely filed. Yet to this day, Midland and its law firms continue to enforce default judgments against New Yorkers, even though it knows it obtained those judgments through fraud. So I repeat: Will Encore commit to vacating judgments that it knows it obtained through fraud, and to providing redress for its systematic extraction of wealth from New York’s low-income communities and communities of color? My name is Nick Loh and I’m from New Economy Project. For the reasons you’ve heard from my colleagues, Susan Shin and Eve Weissman, New Yorkers say “no more, Encore!” You abuse the court system for your own gain so we summon you to the people’s court of NYC to answer for violating due process, defrauding New Yorkers, extracting wealth from low income communities of color, and your ongoing malfeasance that wreak havoc on lives. Vacate your fraudulently-obtained default judgments and provide redress to New Yorkers and New York communities of color now. You can read more about Esther Roman’s story and our work to end predatory debt collection in this cover story in Crain’s New York.